Located in beautiful Richmond Missouri. Ray County is a Missouri Highway Patrol court meaning all tickets originating out of the Court were written by Missouri Highway Patrol. You should have received information about the Fine Collection Center along with your ticket. Most speeding tickets do not require a court appearance unless you were caught going over twenty-five miles over the speed limit. A defective equipment will cost you between $150.00 and $255.00. My charge for Ray County is $135 per ticket. You will be able to pay in cash or through PayPal. All money for fines and my fee must be paid upfront. For more information on how the process works, please go to About Us. Traffic Court in Ray County is on Tuesdays and Thursdays. In most cases, you will not need to appear. 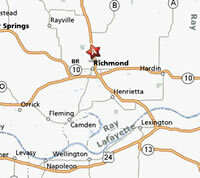 Ray County is home to 24,000 people and the County Seat is Richmond Missouri. Ray County was named after State Legislator John Ray. Ray County uses commissioners in it’s form of government. An interesting dichotomy, Ray County went for George Bush in 2004 with somewhere around 49.4 percent of the vote. But in 2000, Ray County went for Al Gore. It’s largest number of jobs land in the manufacturing sector while transportation is second. Richmond is a gorgeous classic County seat and should be visited by those who appreciate the old town square.